1. Levy a "Parent Tax" on the candy. Let's be honest. It is a lot of work to purchase and/or make a whole Halloween costume and all the accoutrements that go along with it. Not to mention buying candy for the neighborhood, getting your kids dressed, and braving the elements as they go door to door demanding treats from complete strangers. My husband likes to call it the "parent tax," but really he just asks the girls if they'd share a piece or two with him. They are usually so high on sugar fumes that they willingly oblige without any complaints. After they go to bed, we sneak another piece or two without feeling guilty. Much. 2. Keep a bag of lollipops in the car. A secret candy stash can come in handy for traffic (when the kids are screaming in the back seat), doctor's appointment shots (when the kids are screaming), and long waits during sports or dance lessons (when the kids are screaming). Perhaps you see a pattern here. The candy can prevent the screaming. Or at least dial it down a notch. 3. Add some favorites to a small bin. Keep it in the pantry or upper cabinet and save them as special lunchbox treats. 4. Use it for baking. I add chopped up candy bar bits to breads, cakes, and my "famous" Christmas trifle. 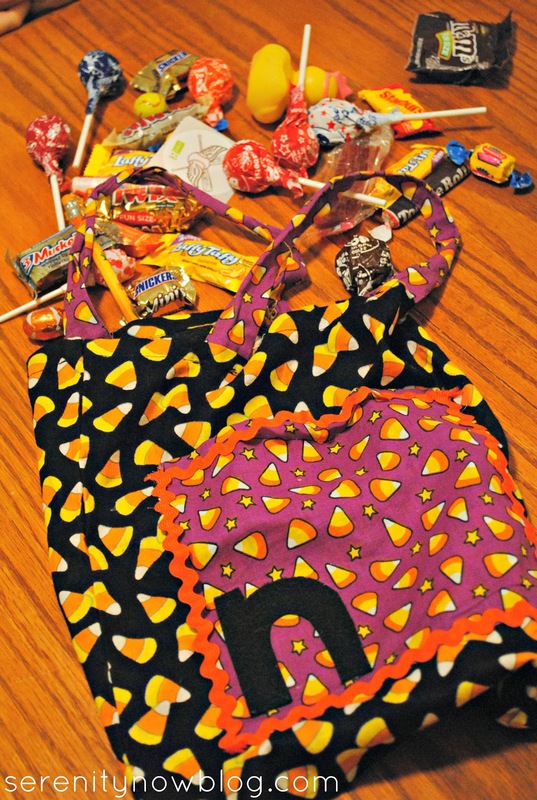 If you have a crowd for Thanksgiving, why not make some cute goody bags with those leftover Hershey bars? My oldest's birthday is in early December, and you better believe those mini chocolate bars make great goody bag filler! 6. Take it to work or send it off with your husband. Everyone at the office will love to hate you for bringing or sending the candy their way. They'll feel a surge of productivity with the sugar rush and you will get a promotion for being so brilliant. 7. Include the hard, wrapped candy in your Operation Christmas Child shoebox. Send it to the troops, a local nursing home, food bank, or a women's shelter! Make a candy corn wreath, or search Pinterest for some cute Thanksgiving printables to make gift baskets or bags for the teachers. So many possibilities. Or, of course, you could just eat it all. Your dentist will love you for that. You can pay for his kids to go to college! What do you do with the leftover Halloween candy? *Tutorial for the DIY Trick or Treat Bags is here. what a wonderful idea to keep some for goody bags, I will do this as my sons b-day party is in a week! Great tips Amanda. A family at my daughter's school is taking candy donations that will go to children in the Philippines when they go over around Christmastime. I think this is awesome! They sent home cute little baggies for us to fill. What a great gift of gratitude for my daughter to learn. Boy oh boy oh boy. I always buy candy for the trick-or-treaters that I know my kids at school will like. I take the leftovers to my classroom and use them as rewards. Growing up my sister and I always picked and traded our favorites. All the leftovers were piled in a jar that was free for all the rest of the year. Great memories! i like the freezing suggestion-duh, never thought of that. def put all the lollipops away for the car and/or waiting at appts, very helpful! We issued a candy tax this year too:) I like to save some of our Halloween candy and use it to decorate our gingerbread houses around Christmas! I put aside a big bag for decorating gingerbread houses in December! Great ideas! My daughter does the candy tax every year. :) I especially like keeping some in the car! Awesome ideas! I am a new follower via GFC, FB, Pin, & Twit! I also linked up a few of my things.